We offer 2 types of Order Pickers or People Lifters as they are also known, the first type is a Manual Push / Pull type with Battery Lift Order Picker. 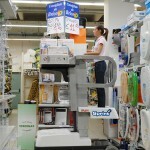 the second type is a Fully Powered Order Picker. Both types enable employees to work at height quickly, safely and efficiently without the need for ladders or forklift trucks. Additional information: Manoeuvrable – Ideal for tight places. Manually propelled – Safe in public areas. Stable at any picking height. Stylish – Will not look out of place anywhere. Fully Powered Order Picker Specifications. Additional information: Can travel up to 30km per charge – adjustable height tray via push button. 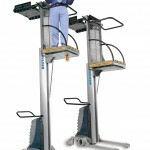 Reduces the possibilty of Falling or Damaged Goods – Stable at any picking height. Extremely Low Maintenance due to Revolutionary Type Mast System.